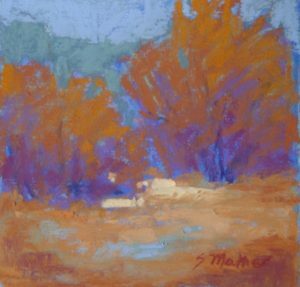 During the month of April, the Paquette Gallery will feature the landscape paintings of local artist Sally Mather. Sally will donate 50% of sales to Ark Valley Humane Society (AVHS) to help build a new shelter! Although Sally spent her professional life as a nurse-midwife providing women’s health care, the need to be creative has always been pervasive in her life. Through the years, she has explored many different mediums – clay, printmaking, oils, acrylics, and watercolors – on her own as well as participating in various workshops and classes. In 1998, Sally’s mother (a garage sale enthusiast) presented her with a set of “garage sale” soft pastels. Sally was hooked! The vibrancy, kinesthetic aspect, and immediacy of the medium was love at first touch. In 1999, Sally moved to Salida, Colorado. 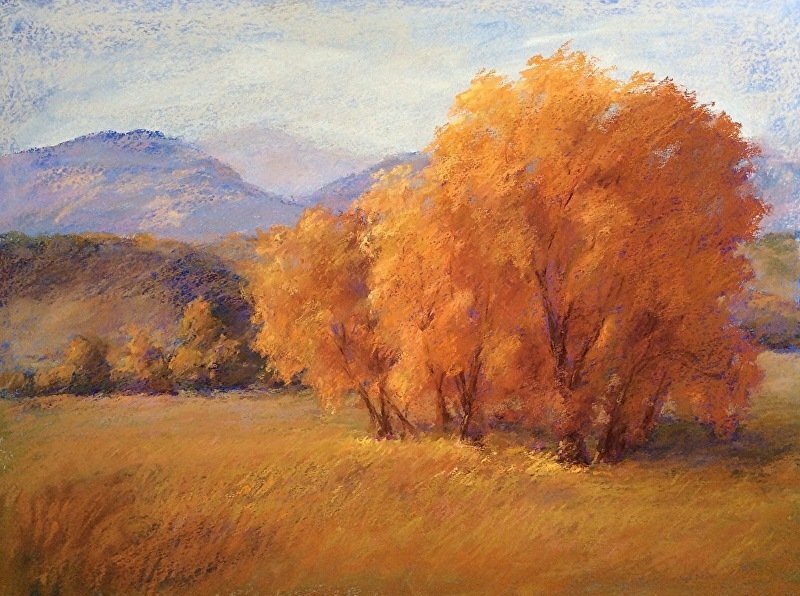 Surrounded by mountains in the beautiful Arkansas River Valley it was a natural evolution to begin painting “en plein air”. 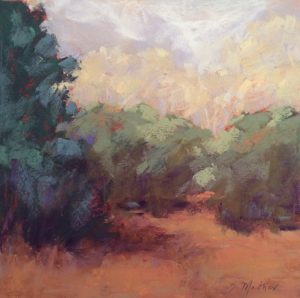 Inspired by nature and painting outside in the elements fueled her creative process. When she is not out hiking in the wilderness with her trusty four-legged companion Izzy, seeking the perfect moment for a painting, she can be found in her studio exploring the endless possibilities of mixed media. Each month, join us for a free artist’s reception with our featured artist. The Paquette Gallery will be open from 4-7 pm with free hors d’oeuvres, wine, and beer. Don’t miss your chance to meet Sally in person and support AVHS! Join the Salida Council for the Arts and the Salida Creative District in the Paquette Gallery for a fine and festive social hour from 5:30 to 7:00 pm. Munchies are served, the cash bar is open, live music will be playing, Sally will speak about her work, and you’ll hear news about the many creative projects being launched.